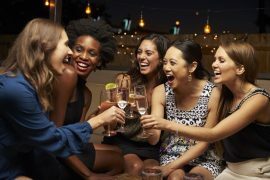 Whether you’re the maid of honor celebrating a bride-to-be or the guest of honor herself, planning a fun bachelorette party can be a great way to enjoy time with the girls before the big day! The laid-back lifestyle and incredible beauty of the Poconos make it a great destination to get away from it all and experience a sweet getaway with your closest friends. Read on to discover some of our best bachelorette party ideas in PA and incredible lodging options! Yoga is a fantastic way to relax and refresh your mind, body, and spirit, especially when you’re in the midst of planning a wedding! Grab your girls and escape to Hawley, PA, for a wide variety of fun yoga classes that you can take together. Several of our beautiful properties in the Poconos provide group yoga classes during the summer. Our yoga classes are conducted by Lake Region Fitness and hosted at locations such as riverside at The Settlers Inn, on the Stargazer Deck of Ledges Hotel, lakeside at Silver Birches Resort, and Hawley Silk Mill. If you’d like to schedule a private yoga class for just the bride and her bridesmaids, contact the hotel of your choice and reserve your date! You also have the option to branch out and try something different such as kickboxing classes at Hawley Silk Mill’s fitness center. For a memorable evening during your bachelorette party in the Poconos, treat yourself and the girls to a delicious evening by sampling menu items at all of our properties. Glass-wine.bar.kitchen at Ledges Hotel is the perfect spot to start your flavorful journey. While you nibble on small plates and indulge in tasty cocktails, you’ll be entertained by live music performances (offered Friday evenings from 8pm-11pm). Once you’ve tasted some delicious appetizers, head over to the restaurant at The Settlers Inn for some of the best farm-to-table cuisine in the area! The seasonal menu is always changing to create fresh mouth-watering dishes. Reservations are highly recommended, so be sure to reserve your table with us soon! The Dock on Wallenpaupack at Silver Birches Resort is another wonderful spot to enjoy a memorable meal with your friends! The menu features a combination of water-inspired foods and unique twists on classic dishes and comfort foods such as seafood dishes, grilled steaks, soups, salads, and sandwiches. Plus, you’ll be treated to spectacular views of Lake Wallenpaupack and live music performances while you dine. If you’re hosting a larger party or want to throw a wedding shower for the bride, the Undercroft Room at The Settlers Inn can be reserved for your special occasion. This event space perfectly unites artistry, simplicity, and nature to provide a comfortable backdrop. The Boiler Room at Hawley Silk Mill is another popular event space that exudes industrial charm and a wide variety of customizable features such as catering, floor plans, and entertainment. The morning after your bachelorette party in Pennsylvania, rejuvenate yourselves with a hot cup of your favorite coffee and a freshly baked treat from Cocoon Coffee House and Bakery at Hawley Silk Mill. Nothing says “bachelorette party” quite like a relaxing day at the spa! You and the girls will be pampered like royalty and return home feeling and looking your very best just in time for the wedding. Here is a quick look at our indulgent spa packages that will reward you with some much-needed TLC. Two nights at The Settlers Inn with a complimentary breakfast each morning. Dinner at the inn’s restaurant for one night. Lunch at The Lodge award-winning restaurant. Use of the spa’s facilities throughout the day, including the hydro massage waterfalls, outdoor whirlpool, and saunas. The price for this package is $550-$575 per person and includes at taxes. Two nights accommodation at the Silver Birches Resort in either a Deluxe or Luxury King Room. A complimentary bottle of wine from our $25 wine menu. Packages start at $592 for a single staying in a Deluxe King Room and vary according to the time of year, days of stay, and the number of people. Two nights in a deluxe suite or one/two bedroom suite. Couple’s massage at Utopia Salon and Day Spa. A gift basket filled with spa amenities. A plate of wine and cheese awaiting you in your suite upon arrival. Full Country Breakfast for two each morning at The Settlers Inn restaurant. This package ranges from $790-$1,080 based on double occupancy and depends upon reservation dates and which suite is chosen. If you need lodging for your bachelorette party in the Poconos, we can help! Our hotels provide fantastic room options, but our vacation rentals may be ideal for larger groups. These lovely and spacious homes provide you and your party with all the comforts of home within walking distance of Hawley’s best attractions. From cozy bungalows to large lakefront houses, you’re sure to find the perfect accommodation for you and your friends. If you love our bachelorette party ideas in PA, then you’ll definitely want to make plans to visit us at Hawley Silk Mill while you’re here! Our unique and vibrant lifestyle center in the Poconos has stood since the 1880s and has been a major icon in the Hawley community for 130 years. During your visit, surprise your bride-to-be with a shopping excursion in our one-of-a-kind shops, take a fun cooking class, or view local art in the Looking Glass Art Gallery. The options are nearly endless! We look forward to seeing your bridal party soon.